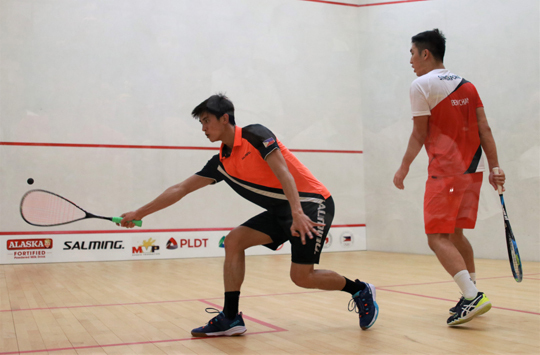 Reymark Begornia capped his improbable run in the 5th Southeast Asian Cup Squash Championships Wednesday night with an 8-11, 11-8, 11-5, 9-11, 11-9 win over Sinapore’s Benedict Chan in the men’s singles finale at the Kerry Sports courts inside the Shangri-la Hotel in Taguig City. Reymark Begornia goes for a backhand shot against Singapore’s Benedict Chan in the men’s singles finals of the 5th Southeast Asian Cup Squash Championships at the Kerry Sports courts inside the Shangri-la at The Fort last Wednesday. In an intense duel of nerves in the deciding fifth and final set, Chan was the first to blink, succumbing to three successive mid-game errors that Begornia exploited on the way to capturing the gold medal after 61 thrilling minutes of action in the tournament organized by the Philippine Squash Academy. It was the first major international title for the lanky 5’11” racket-wielder, who completed a four-match sweep of his stint that gave the hosts their first mint in the six-nation competition backed by the Philippine Sports Commission, Philippine Olympic Committee and MVP Sports Foundation. “I just kept my patience, especially in the fifth set. Medyo magulang po ang kalaban pero pagod na rin siya,” noted Begornia in savoring the hard-earned triumph that drew cheers from the small but lively hometown gallery. A gold medalist in the 2017 Malaysia Southeast Asian Games, Chan played it shrewdly in the opening set, using his drop shots that often caught Begornia off guard in seizing the early initiative. But the Filipino got into groove and raised his game to another level in the next set, showing the skill that Yam saw in him in knotting the count at 2-all. Begornia was untouchable in the third set, dazzling Chan with an array of shots from all over the court in scoring eight consecutive points for an irreversible 8-2 edge en route to a 2-1 set lead, seemingly poised to end the match in the next one. Chan, however, also showed his resiliency in gamely battling the hometown bet on even terms before clinching the set equalizer as Begornia committed an obstruction on the final point. With the count at 5-all in the winner-take-all fifth set, the Singaporean finally buckled and committed three consecutive errors, while Begornia, sensing blood, tried to go in for the kill. Chan made his last stand and close to within 9-10, only to see his comeback cut short after he was penalized a point for blocking the path of Begornia as he tried to return the shot. Action resumed yesterday with the mixed team event scheduled for the morning and evening. The Philippines is bracketed in Group A with Thailand and Indonesia while Group B is composed of Singapore, Malaysia and Brunei, with the top two squads in each group advancing to the crossover semis today.